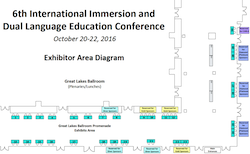 This conference is being hosted by the Center for Advanced Research on Language Acquisition (CARLA) at the University of Minnesota and will be Held in October 2016October 2016downtown Minneapolis at the spectacular Hyatt Regency Hotel. Exhibit tables will be organized in the Great Lakes Promenade, a central area adjacent to the Great Lakes Ballroom where plenaries and lunches will be held. 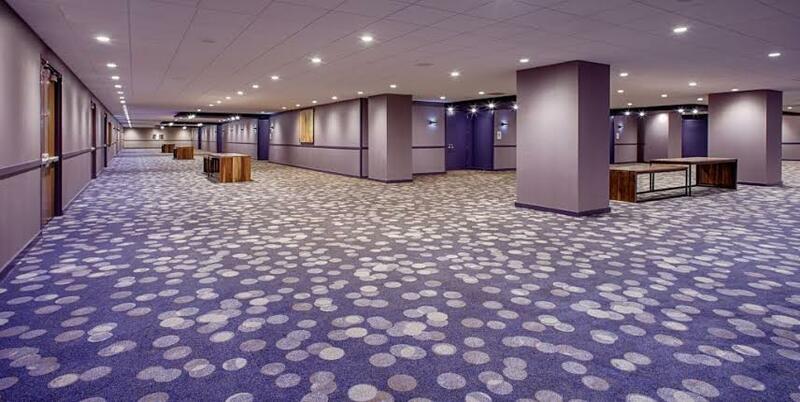 The Promenade will also house the morning and afternoon coffee service on both days of the conference. See picture below. 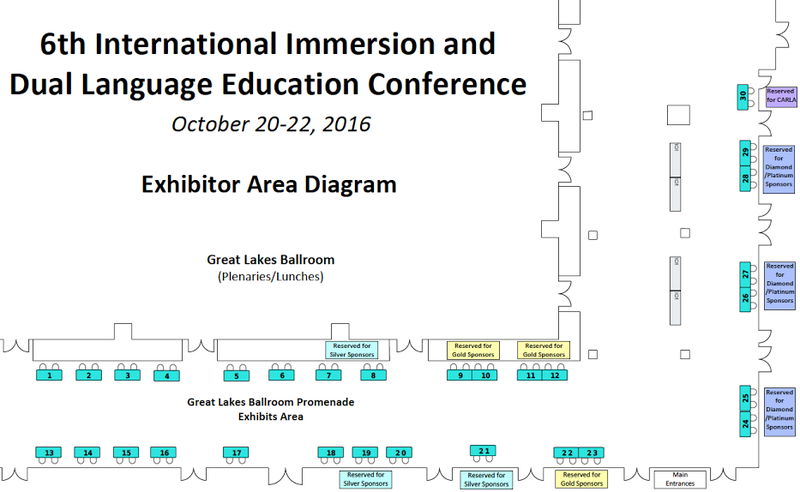 Exhibits should offer materials and services related to PreK–16 immersion and dual language teaching as well as texts and resources for immersion/dual language researchers and teacher educators. 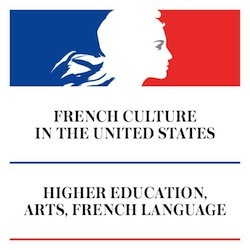 Content materials (math, social studies, science, language arts) in non-English languages as well as professional development materials for immersion teachers are welcome. 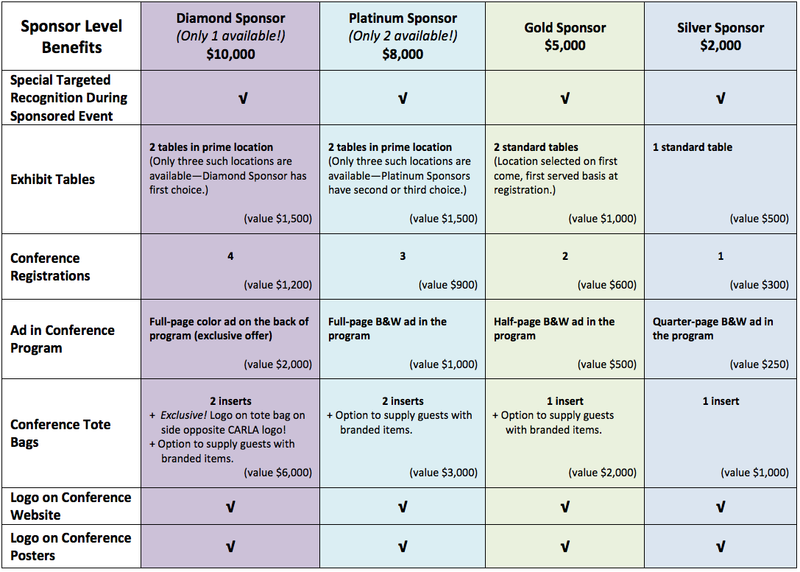 If you are interested in becoming a Diamond or Platinum Sponsor, please email immconf@umn.edu. Payment for the exhibit space must accompany application (see below for payment information and guidelines). Conference registration is not included in the exhibitor fee. Exhibitors who want to attend sessions or meals as part of the conference should register for the conference in addition to paying for an exhibit table. Conference registration and meals, however, are included in the sponsorship packages listed above. Program Ads: Various sizes available. Must send print-ready PDF to CARLA no later than August 15, 2016. Inserts: $1,000 per print piece inserted into the conference tote bag (e.g. brochures, fliers). Sponsor must supply the piece. Branded Items: $1,000 per branded item (e.g. pens, pencils). 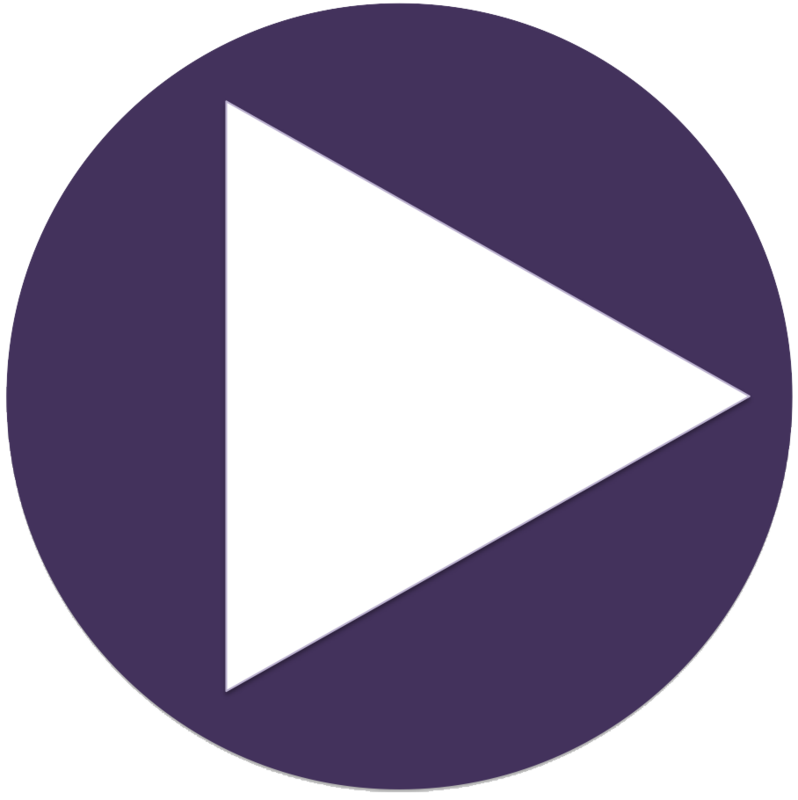 Option to have it inserted or made generally available at the conference. There are no exhibits during the pre-conference workshops on Thursday. Set up: Exhibitors can set up their tables on Thursday, October 20 (between 1:45 and 3:45 pm or after the reception at 8:30 pm or Friday, October 21 before 8 am). Tear down: Exhibitors can take down displays on Saturday, October 22 (between 2:00 and 5:00 pm). Exhibitor shipping: Download exhibitor shipping and cost information and order form. Register online to become a sponsor/exhibitor/advertiser! All registrations for exhibit tables and other advertising options must include credit card payment. Note: Refunds minus a $100 processing fee can be granted if written notice is given on or before August 1, 2016. No refunds will be given after this date. All sponsor/promotional items must be paid for in advance. Any inserts, ads, branded items, lanyards, and logos for items not received by these dates may not be shared with the conference attendees. Exhibitors should NOT ship to the CARLA office. Only paid promotional items may be shipped to the CARLA office. Ads: Send the print-ready ad as PDF, JPEG, or TIFF to CARLA at carla@umn.edu no later than August 15, 2016. Branded items: (Anticipated need is 1000 pieces.) The company-produced, branded item must be received by the CARLA office no later than September 15, 2016. Logos: Please send the logo for the conference website as soon as possible to carla@umn.edu. High-resolution logos for the conference posters must be received by September 15, 2016. Option 1: (Company supplies artwork for logo. This option is more expensive.) CARLA will have the artwork printed on lanyards. Single color only. Artwork must be sent to carla@umn.edu no later than August 15, 2016. Option 2: (Company produces lanyards. Anticipated need is 1,000 Lanyards.) Must be received by the CARLA office no later than September 15, 2016. For questions about conference sponsorships and exhibits, please e-mail immconf@umn.edu.